Faithful friends who are dear to us gather near to us once more! Who better to spend holiday viewing time with than preschool favorite Thomas and his engine friends! Join the jolly engines and merry townsfolk of the Island of Sodor for an all-new collection of Yuletide-themed episodes in Thomas & Friends®: A Very Thomas Christmas, available on DVD, Digital Download and On Demand Oct. 9, 2012 from Lionsgate Home Entertainment and HIT Entertainment. From snowmen to evergreens, presents and good cheer, Thomas is chuffing down the tracks to deliver a merry Christmas for all and for all a good night … of viewing! Featuring four all-new episodes, the Thomas & Friends: A Very Thomas Christmas DVD will be available for the suggested retail price of $14.98. Digital Download and On Demand offers an additional bonus episode. All aboard for a special holiday delivery filled with friendship, teamwork and fun! Rheneas slows down and discovers the perfect Christmas tree. Charlie knows how fun snow can be and discovers that teamwork in the snow is the most fun of all. Edward gets Salty just what he asked for – the perfect story to re-tell -- and Emily learns the best way to be Really Useful. Unwrap the holiday adventures with Thomas and his friends and best wishes for A Very Thomas Christmas! 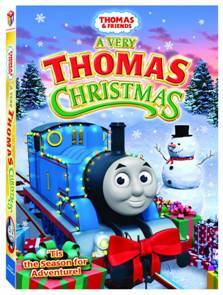 This DVD mixes two of my son's favorite things: Christmas and Thomas the Train! This is a fun DVD that will get your children in the Holiday spirit! Win It: Lionsgate and HIT Entertainment is generously offering (1) Thomas & Friends®: A Very Thomas Christmas to a lucky winner!